This average-girl-turned-fitness-model underwent a dramatic transformation in her 20s. In her 30s, she's keeping it up while navigating motherhood! Weight gain during a pregnancy is normal—and necessary. But it can still be alarming for many women, particularly if they've experienced a dramatic transformation earlier in life. Ten years ago, Kelsey Byers was indulging in the poor eating habits and lifestyle of a typical college student: staying up all night partying, drinking too much alcohol, and eating junk at all times of the day. Then one day, she realized she had gained 50 pounds since high school! She decided to turn things around, and the rest, as they say, is history. She not only lost the weight, she ended up embarking on a career as a fitness model and online coach. We originally wrote about Kelsey's transformation on Bodybuilding.com three years ago. People often say that fitness is a journey. There may be a beginning, but there's no real end to the process. 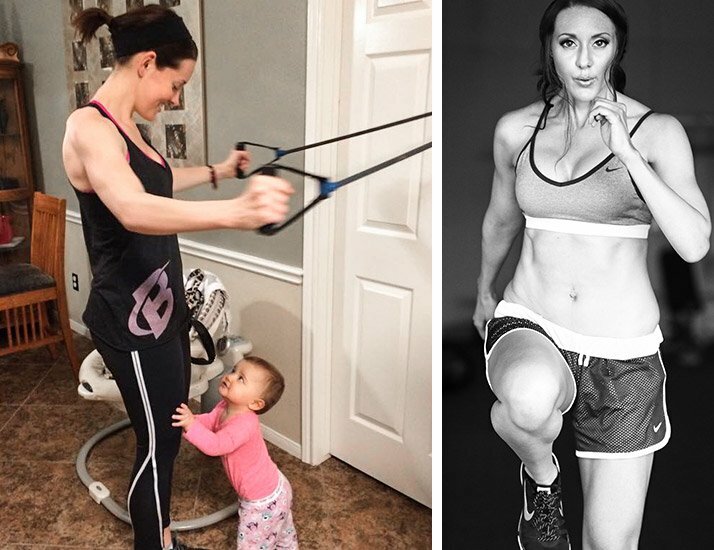 So we've caught up with this transformation-success-story-turned-fitness-model to peer into part two of her journey: being a fit mom! Hi, Kelsey! It certainly has been a while. Why don't you fill us in on the last couple years? Time flies! My life has changed significantly in the last few years. My husband and I decided to start a family. We had our first baby in February 2014. Her name is Brinkley, and she is almost two years old. We are so in love with her, because she brings so much joy to our lives. Congratulations! How have pregnancy and family life impacted your lifestyle? As a family, we still eat healthily, although since we are busier, we use meal-replacement shakes and bars to avoid so much meal prep. As a mom, there's nothing better than a quick, healthy meal on the go. During my pregnancy, I stuck to an overall healthy meal plan but also splurged on three cheat meals a week. I didn't want to feel deprived. I gained about 30 pounds during pregnancy, which is crazy when you think about the 50 pounds I gained back in college! I even joked that I had been heavier in college than at 40 weeks pregnant. I breastfed once my baby was born, but it took me about six months to feel comfortable in my body again. She was worth it, though! I love her so much. The great thing is that, as Brinkley's getting older, we finally get to see what it's like to set a healthy example for her. The great thing is that, as Brinkley's getting older, we finally get to see what it's like to set a healthy example for her. She pretty much eats the same food we eat: chicken, lean turkey and beef, veggies, yogurt, and so on. Plus, she is not a picky eater, which is a great thing. Years after your transformation, how do you view food today? Before my 50-pound weight loss, I viewed food as entertainment and a way to distract myself from boredom. I still enjoy my food, but now I look at it as fuel—either fuel for training, or fuel for life. I often ask myself, "How will this food make me feel?" and that helps me make the right decisions. I am definitely not perfect 100 percent of the time with my eating, nor do I want to be. Even now, I typically stick to a clean meal plan all week and have one cheat meal on the weekend. I still eat every three hours and 5-6 meals a day. This is what worked for me before, and it still works! Has having a third little person in the mix changed anything for you, fitness-wise? Before I had my daughter, my husband and I had different schedules. We'd come home from work, take a nap, and then go to the gym together. Once you have a little one, your priorities change. We had to figure out a new schedule and determine how to keep our health and fitness a priority, because we certainly want to stay healthy for her! She's a toddler now, so it takes a lot of energy to keep up with her. We need to make sure our bodies are fueled the right way. When I was first cleared to work out, I stuck with at-home workouts during Brinkley's nap time. As a new mom, I initially struggled with making myself a priority. I definitely had some "mom guilt" about working out when I could be home spending time with her. I finally realized that I am a much happier and healthier person when I get 30-60 minutes a day to be active. When I am in a peaceful state of mind, it benefits my family and relationships as well. When I was first cleared to work out, I stuck with at-home workouts during Brinkley's nap time. Once she got a little older, I started going back to the gym while my husband stayed home to be with her at night. Now, my husband and I take turns working out and have a new schedule now with our little girl. It works great for us. Ten years after beginning your transformation, what would you tell the 23-year-old Kelsey? If I could talk to the me of my earlier college days, I would definitely tell myself, "You are going through this for a reason, and God has a big plan for your life. You are going to help thousands of women create healthy habits and feel great about themselves." Looking back, I worried too much about what people thought of me for missing a happy hour to focus on my goals. There is so much more out there than living a life centered around food and drinks. Don't get me wrong, it's fun going to happy hour with my friends. But in college I ignored the idea of moderation and simply did it to excess. Drinking alcohol usually led me to snacking on the wrong foods and the not-so-healthy options. In moderation, it's fine, but there needs to be balance! In your twenties, you set and achieved some lofty goals, such as competing and building a career in fitness. What are you working toward these days? I always love to set big amazing goals that scare me. I appeared on the cover of Oxygen Magazine back in 2012, so I'd love to shoot for them again as a goal, after having my daughter. I would also love to do shoots for Strong Fitness Magazine and Bodybuilding.com. Overall, I just want to act on my passion for reaching out to people with my weight-loss story. Even more so now that I'm a fit mom. In my opinion, the more people I can inspire, the better. I want to let people know that anyone can do what I do; you just have to build healthy habits. In my opinion, the more people I can inspire, the better. I want to let people know that anyone can do what I do; you just have to build healthy habits. Once something becomes a habit, you can do it without struggling. The first step is always the toughest, because we all want results right now, but it takes time and consistency. My husband and I just set a new 12-week goal to be in fantastic shape before 2016 hits. We like to set short-term goals to hold ourselves accountable. I coach thousands of women online through my training programs, so it's important to me that I lead by example. These days, I tend to drink all-natural meal replacement shakes and bars that have no artificial sweeteners. While food is ideal, I have to be realistic with what I can do and have energy for. Coffee is typically my pre-workout drink of choice right now. I also use some great multivitamins that come in an AM pack and a PM pack. That way, I'm not buying a ton of vitamins—everything is in one convenient package without the extra guesswork. Keep it simple! Before every workout, I warm up with five minutes of stretching and five minutes of cardio.